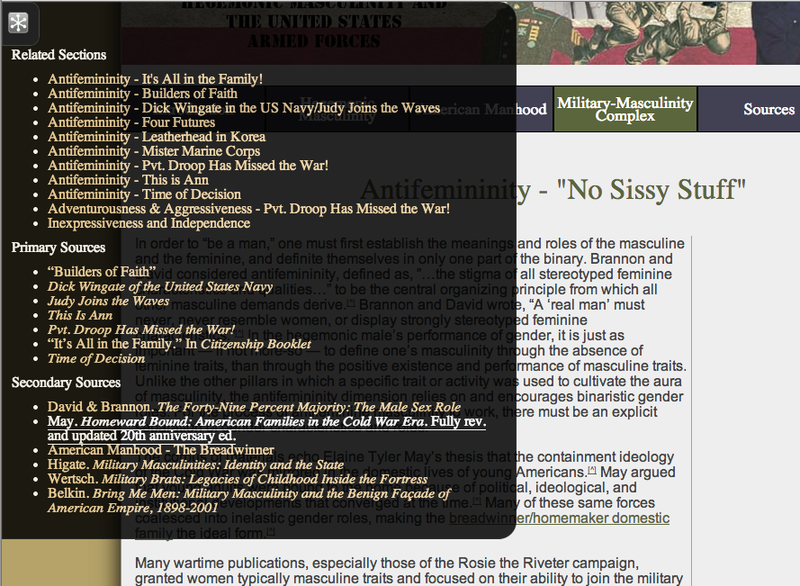 The items on the primary navigation set out the major sections of my thesis – introduction, theoretical grounding (Hegemonic Masculinity), historiography (American Manhood), original research and argument (Military-Masculinity Complex), and bibliography (Sources). The Military-Masculinity Complex section is then further broken down into four main sections of argument, each of which include a narrative that relates secondary sources and several exemplary pieces of primary material to my argument. At the bottom of each of these pages is a section that links to a several other examples of the archetype in other texts, and explores them in greater detail. Users can choose to read more about a specific archetype, or further explore specific subsections of my corpus (i.e. 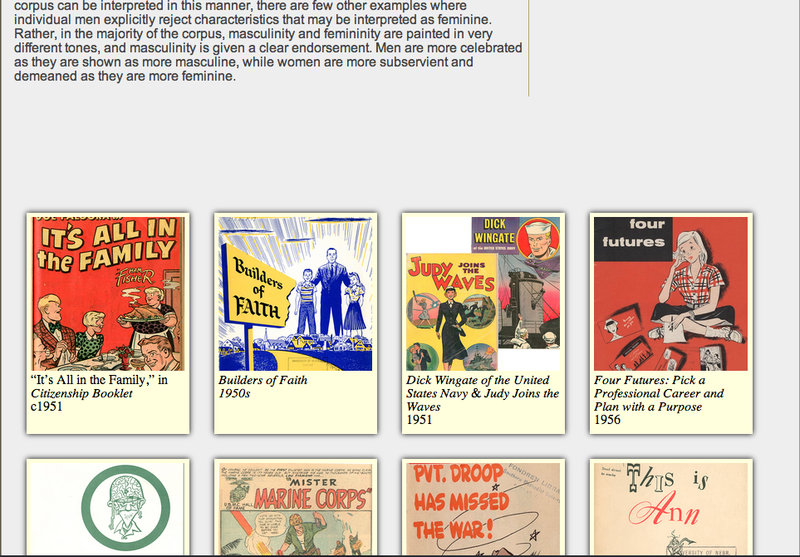 postwar Army documents or WWII-era Marines comics) as they desire. The navigation bar backbone and ‘layered pyramid’ structure, while useful in organizing my work and helping users understand where they are, did not do much in the way of free exploration across concepts. Users would be able explore the different layers of the pyramid, as Darnton suggested, but weren’t really able to browse and explore in a non-linear way. In order to facilitate a better understanding of the scholarly context, and promote movement between pages and topics, I added a pop-out panel of resources and additional reading. This came largely from meditating on Vannevar Bush’s famous piece, “As We May Think,” which challenged me to think more deeply about the connections between scholarship and sources, as well as the usefulness of embedded links between them. I wanted to place a collection of links to all of the resources cited or otherwise related to the page, so that readers can easily jump to another section that utilizes a similar concept, argument, or source. This offers a much freer way for users to read and explore my argument, or further explore key concepts or resources. This portion, which expands out over the page, serves as an “enhanced” bibliography — that is, it includes every source that is linked from the page, as well as pages that link to the page, and other pages within the same hierarchical class. Through these methods – a “layered pyramid” with networked links lain over the top – I developed a structure and design that I hope leads to useful exploration and discovery. 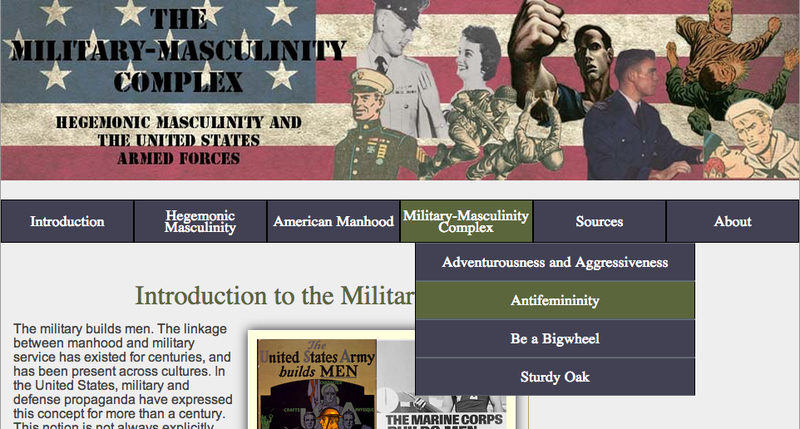 In my next post, Building “The Military-Masculinity Complex”, I will tackle the workflow, code, and applications I used to create my project.